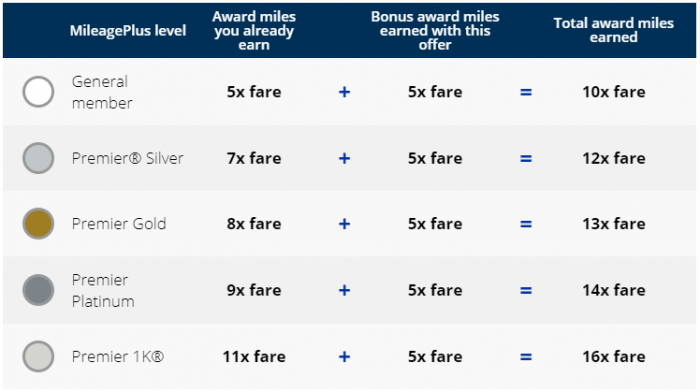 Nice that these bonus miles offers also apply to connecting flights, although it is fairer than awarding miles based on the segment value on complicated itineraries. Mexico City is a fantastic and vibrant destination, and always worth a visit. 1. Registration is required by May 31, 2019. 3. To earn the bonus, you must register for this offer prior to booking and completing a qualifying flight. A “qualifying flight” satisfies each of the following: (i) includes a segment between New York/Newark (EWR) and Mexico City (MEX) (ii) complies with the ticketing and travel dates listed below, (iii) is operated by United or United Express (offer is not valid on United-marketed codeshare flights operated by other carriers) and (iv) must be booked in paid Economy or paid Business fare classes. 6. For qualifying flights, bonus award miles will be credited in an amount equal to 5x the fare*. 5x the fare* will be awarded for qualifying flights between the United States and Mexico City (MEX) when the flight segment New York/Newark (EWR) to Mexico City (MEX) or Mexico City (MEX) to New York/Newark (EWR) is included on the itinerary. 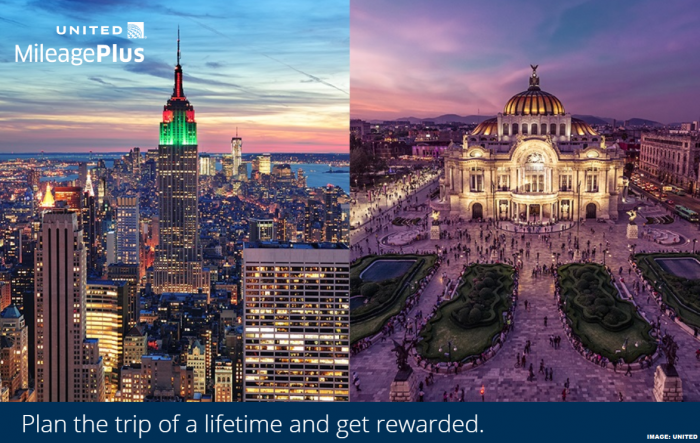 Connections to/from New York/Newark (EWR) and Mexico City (MEX) are also eligible for bonus miles. Bonus does not apply to any upper cabin fare multiplier. 12. Offer is not combinable with other non-combinable offers or route specific promotion that includes the same destination included in this offer. Miles accrued, awards, and benefits issued are subject to change and are subject to the rules of the United MileagePlus® program, including without limitation the Premier® program (the “MileagePlus Program”), which are expressly incorporated herein. United® may change the MileagePlus Program including, but not limited to, rules, regulations, travel awards and special offers or terminate the MileagePlus Program at any time and without notice. United and its subsidiaries, affiliates and agents are not responsible for any products or services of other participating companies and partners. Taxes and fees related to award travel are the responsibility of the member. Bonus award miles, award miles and any other miles earned through non-flight activity do not count toward qualification for Premier status unless expressly stated otherwise. The accumulation of mileage or Premier status or any other status does not entitle members to any vested rights with respect to the MileagePlus Program. All calculations made in connection with the MileagePlus Program, including without limitation with respect to the accumulation of mileage and the satisfaction of the qualification requirements for Premier status, will be made by United Airlines® and MileagePlus in theirdiscretion and such calculations will be considered final. Information in this communication that relates to the MileagePlus Program does not purport to be complete or comprehensive and may not include all of the information that a member may believe is important, and is qualified in its entirety by reference to all of the information on the united.com website and the MileagePlus Program rules. United and MileagePlus are registered service marks. For complete details about the MileagePlus Program, go to united.com.